Cheap parking in Seville: where to park in Seville? 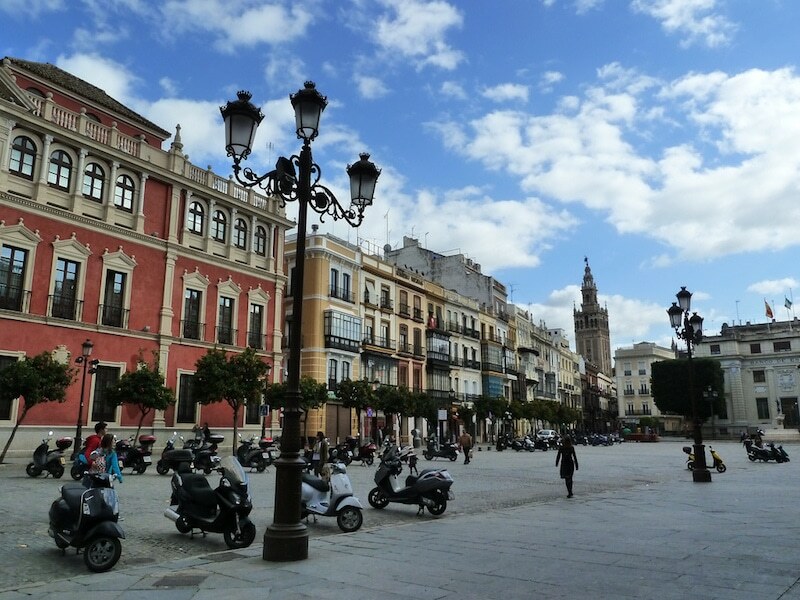 Traveltipy > Spain > Seville » Cheap parking in Seville: where to park in Seville? 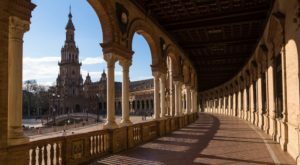 If you are traveling to Seville by car or if you plan to rent one, it is useful to know where to find a cheap parking in Seville. If you plan to stay more than 3 days in Seville or if you wish to visit specific tourist sites in the Andalusian hinterland, you may find public transport to limit your options. Having a car, rented or not, is very useful to explore and discover the city’s surroundings, go to the beach, etc. However, whether you come with your own car or rent one for a few days, an important question arises: where to park in Seville? 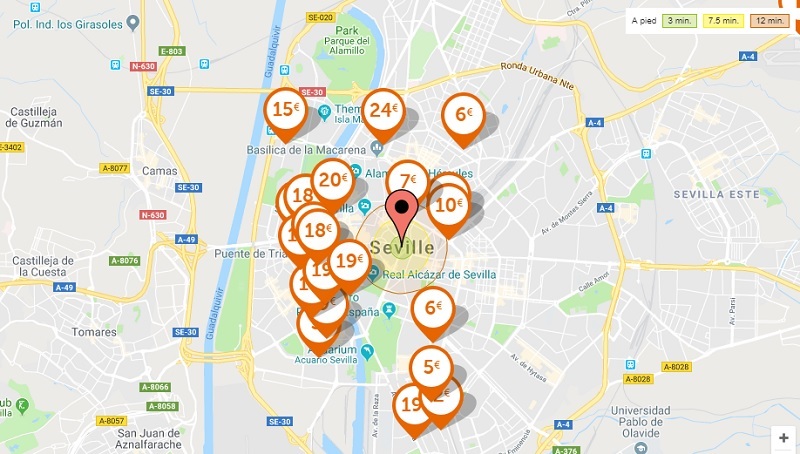 Where to find the best car parks or cheap parking in Seville? Paid street parking is not the best solution. Almost exclusively pedestrian, the city center of Seville is a maze of narrow streets, and it is thus complicated to find a space. Moreover, rates are exorbitant, and the duration is short! Besides, the municipality takes parking bans very seriously: parking in a prohibited area is liable to a €145 fine and immediate vehicle impoundment. You can also find paid street parking spaces on the outskirts of the city, at more affordable rates, and from there reach the city center via public transport. However, we advise you to avoid paid street parking: there are many cases of vandalism on foreign plates or on very recognizable rental vehicles. There are better parking options in Seville. 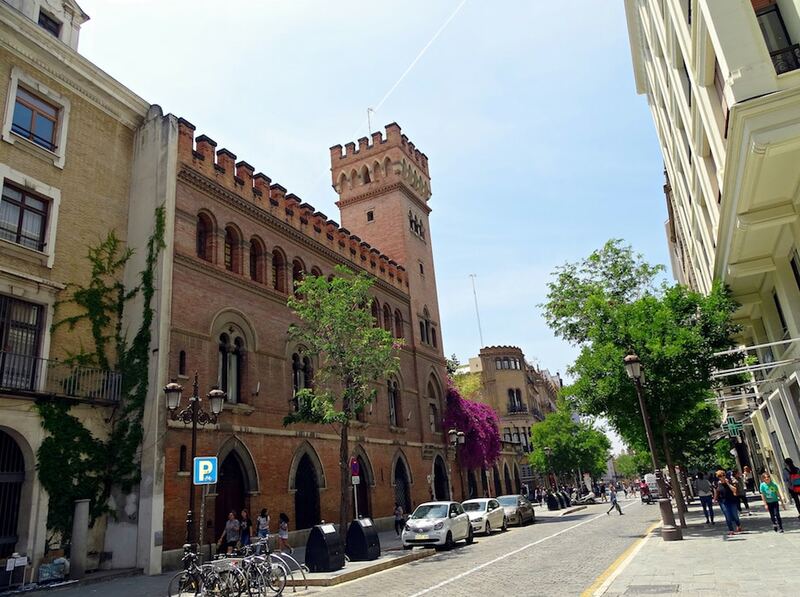 If you do not want to pay for parking in Seville, a second option is to park your car outside the paid parking areas, and then use public transport to reach the city center. If you park in residential areas or on the outskirts of Seville, you shouldn’t have too much trouble finding a free parking space. From the suburbs, it is easy to get to the center via public transport. For example, it is possible to park near the end of line 1 (metro) near the Cocheras or La Plata stations. However, keep in mind that parking on the street with a foreign or rented car may present safety risks! There are many indoor car parks in Seville. If you’re looking for a 24h parking service, plan to pay between €10 and €35 per day on average. The tourist office issues a map of all the city’s car parks. In the center, the cheapest car parks are the INSUR Mirador car park in Santa Justa and the INSUR car park, further south from the former and close to the San Bernardo metro station (line 1). Both of them are situated very close to the historic center. Make sure you book in advance a parking space near your hotel. Some hotels even offer discounts, do not hesitate to ask. You can also opt for accommodation with private parking. In summer, it is not uncommon for some car parks to be full. By booking in advance, you are sure to have a covered space in a secure car park. Photo credit: Flickr – Jose A. They are free and supervised, but they are only open from 6:30 a.m. to 11:00 p.m. during the week, and from 7:00 a.m. to 2:00 a.m. on weekends. You will also find free, unattended parking in Seville at the Blas Infante station, behind the Parque de Los Principes in Triana.